Good fire making skills are an invaluable asset in the wilderness. We recommend having multiple fire starting methods at all times and even then making fire in inclement weather can be challenging. 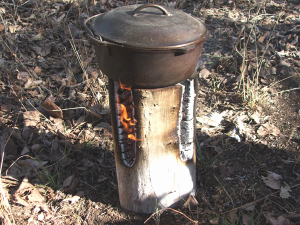 This two day Advanced Fire Making course has been designed to further enhance student’s fire making techniques. Many modern fire making methods will be covered including Flint and Steel, Ferro Rods, Convex Lens, Fire Pistons, Batteries and more. Tinder, coal extenders, char cloth, and various commercial fire starters will be demonstrated and students will have the opportunity to try many different methods and products. Students will receive a Ferro Rod fire starter to take home. Knowing how to build the correct type of fire lay is an important wilderness skill. A fire will provide warmth in cold weather, allow you to cook food and purify water, it provides light and protection and is a good moral booster. Day two gives students an opportunity to make various types of fire lays, compare the differences and learn which are most effective. Teepee, Pyramid, Dakota, Reflector, Swedish Candle and more will be constructed during this course. Fire safety, the physics of fire, tinder and kindling will also be addressed. This is a two day course. Tent and hammock camping is available and students are encouraged to bring any gear they would like to use or try out. Porta potties, fire rings and firewood are on site. Most cel carriers have good reception. There is no electric, gas or water.